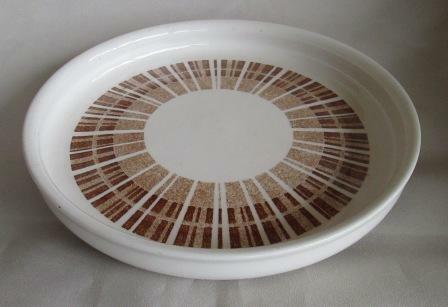 This is a lovely dish in the Hospital Ware range ... oops I forgot to measure it! This from Jim's Collection 22 x 3 Flan in Brown. That looks the same as my one above and I still haven't measured mine. 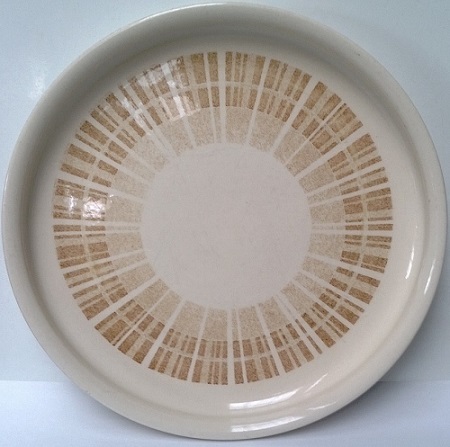 I've just bought a box of these on tm from Marl, in plain white (clear glaze), and am wondering whether we have a number for them yet. (I presume the ones I've bought will also be vitrified: if not that would be yet another shape to identify.) 65 mm high is nearly a match for the 3618, but the body looks more like the 3038 so it may be 3038 body in vit. I will be looking to find a saucer shape to fit them too: it will be a wide well vit saucer and the only one I can think of is the Cook & Serve so I have a bit of research here. I'll check both 3- and 4-digit in the gallery for unidentified pieces. I'm curious about Jonno's one too. The diameter he gives is (at least) quarter of an inch bigger than I would expect. The handle is similar to a Cook & Serve can but doesn't look quite right. Jonno wrote: ... the handle is different but the shape is so close with the straight sides and the neat little cove at the base. I had put Marl's listing on my watchlist as she mentioned a Crown Lynn box and usually there is a number on the box in relation to what it contains. I have a plain one in this shape and I think of the handle as a 3050 shape. I thought I'd seen one at your place, Ev, but when I went to the topics I saw it was mrnarna's one posted. Yes, I thought it may be a bit round for 3050 handle but just checked and it does look the same, but vitrified. It will be interesting for me to compare this with my other cans. That makes 8 different can shapes for me now including the CookServe and it's three copy shapes, the two 3038s, Modello, and now this hospital shape. I'll post the different shapes all together when I have the new ones, and any other information I can glean from the box. Next month! Been raining all day here, just drizzle. There was a bit last night too so we didn't go to Tikipunga market this morning. I guess this is the cyclone: thought Auckland might be a bit more sheltered. We cleared the walnuts from the ground so they wouldn't spoil and I've just been shelling and chopping for a loaf. There'll be plenty more out there when the cyclone passes. Thanks for that pic. Handle size difference could be explained by e/w vs vit shrinkage. Your mug has a mini-me. Cute. 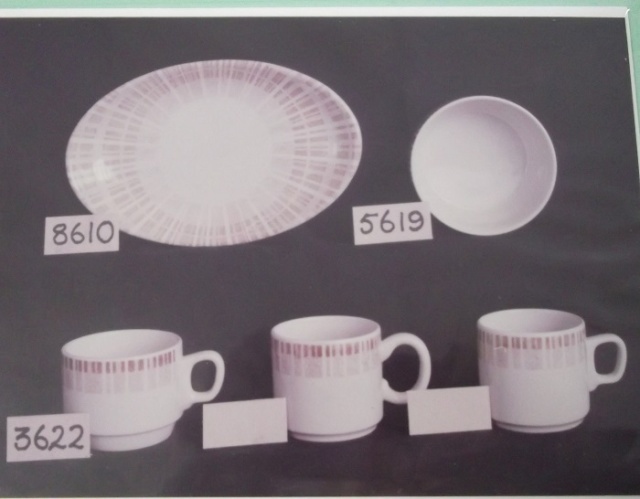 This shape appears here first as part of the new hospital ware range which was published in 1978 so presumably dates from that time, however the cup for that range was the 3610 so I'm thinking the can is a replacement shape for the 3610 within the range. The upper limit for date will be when the hospital ware range went out of production, if indeed it did before CL closed down. 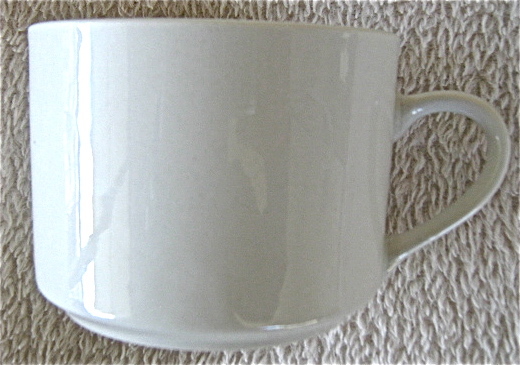 The 3050 handle shape first appears on the 1314 castware mug in 1979 then on the 3050 and 3802 in 1980. 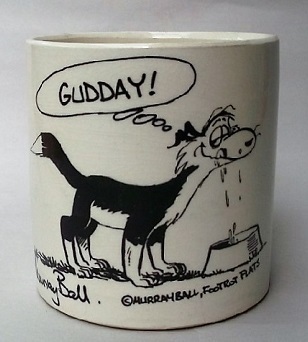 The cylindrical body with coved footring appears from 1974 as the 3036 (mug), and in 1975 as the 3037 and 3038 cups or cans. I'm pretty sure as I said above this cup was to replace the 3610 in the hospital ware range. As the handle did not otherwise appear until 1979/1980 I'm guessing it's a 1980s shape. Last dates I'm seeing for cups are 1984. I picked 3639 for the NZ Party mug as the timing was so good, and am still happy with that as this is definitely a "cup" rather than a "mug". I think this will be 3640 or later. Matched vit saucer could be 3650 12.9.83 "same as 4050". 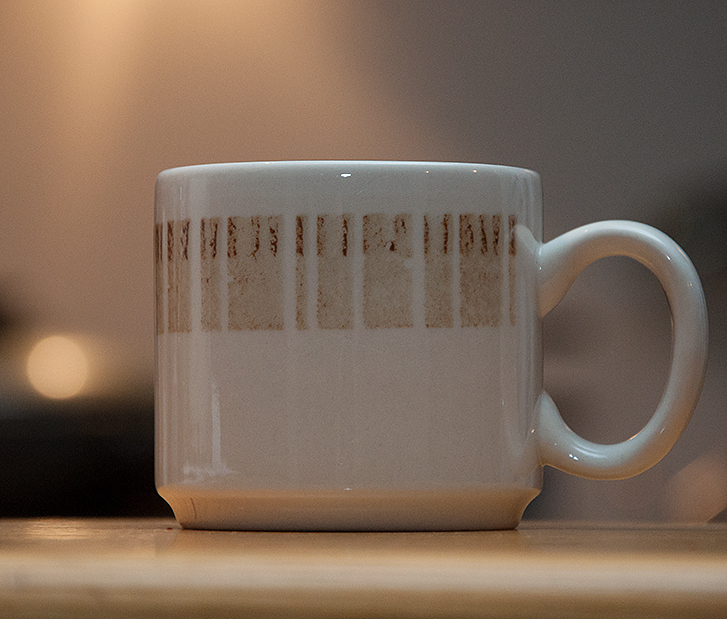 I have said elsewhere that the 3038s sit nicely of the 4050 (supposing that to be the wide-well one), so allowing for equal shrinkage in cup and saucer to the vitrified size I think it would be a good match. So who's seen a 4650? We don't have one. Next stop: check Portage! I've got as far as 3699 with no luck. My posting in this thread is dated Jonno on Thu 11 Oct - 21:16 and I think that would have been 2014. 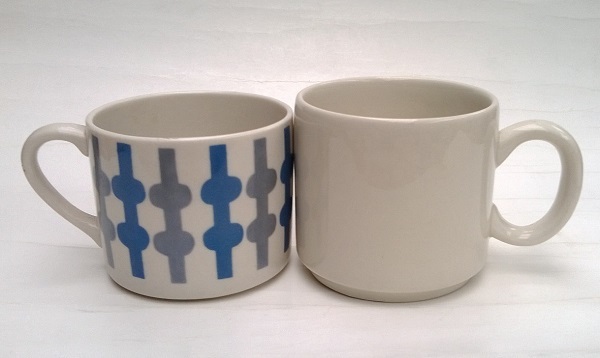 The full text of my post mentions that there were no markings and I bought and posted the shape simply because of its strong similarity to the CL Hospital Cup Shape. That is why the measurement is different and of course the handle is also different. Could have been UK or Eastern make. Thanks Jonno. I didn't think you were claiming it as Crown Lynn but was allowing for the possibility that it was in my discussion. I too collect similar items for the purpose of comparison, particularly similarity with the CL Cook & Serve coffee cans as they were my first CL collection, and were themselves a copy of the Rorstrand. I'm looking forward to a side by side comparison of the Hospital cup and Cook & Serve can. the diameter is the same, different heights and different base and of course different handle. I've made a similar comparison with a 3038 which appears to stand a wee bit higher than the a Hospital cup against the 782. I'm still thinking 3038 body but vitrified to account for the height difference, and 3050 handle with vitrification shrinkage accounting for size difference there too. When I get mine I'll post a montage of 2 different 3038s, hospital cup, and Cook & serve, all in plain white. I'll also shoot one on a 4050 saucer (or whichever variation has the wide well) to show what I think it should look like. Very happy to have found all of the Hospital shapes at the Portage Museum from 1985, but there are no numbers on the cups that we have!